Public Domain Torrents is a website that has hundreds of free movies, some of which you can stream directly from their site and others that you're able to download and keep forever. Although most of these movies require you to download a torrent file — a data type notorious for spreading copyrighted movies — these films are completely legal to take. While you won't find new releases here, it is a gold mine of classics that you might not find elsewhere. You can also be confident that all the movies here are in the public domain, something you can confirm when downloading movies from other torrent websites. Unlike some of the better free movie streaming services, Public Domain Torrents often behaves erratically, making it difficult to stream or download anything. Try a different movie download website if you have issues. There are tons of great movie genres at Public Domain Torrents. You can find videos listed under drama, horror, musicals, westerns, family, animation, action/adventure, comedy, martial arts, war, mystery/suspense, sci-fi/fantasy, exploitation, and serials. You can filter through all the movies to find the most shared movies and the recently added movies. This makes finding popular and new movies a breeze. You can also browse all the free movie downloads from one page. There are over 900 to look through! Some of the most popular movie downloads on this website include A Boy and His Dog, Night of the Living Dead, Nosferatu, Gulliver's Travels, Sherlock Holmes - Dressed to Kill, The House on Haunted Hill, The Secret Life of Adolf Hitler, and The Little Shop of Horrors. If you'd rather not mess around with loading up these movie torrents in a torrent program and waiting for others to share the films with you, visit the STREAMS page to see all all the free movies you can stream right away (no download necessary). Flash is required in order to stream movies from Public Domain Torrents. However, even with Flash enabled, we were unable to stream several movies because they just wouldn't start. Visit the download page for the movie you want to save to your computer. Scroll to the bottom of the page to locate the download links. You can usually get these movies in various formats, including MP4 and AVI. Save the .TORRENT file to your computer or right-click and copy its URL. Load the torrent into your torrent client to start the download. Unlike an established torrent website which shows how many people are sharing the movie, Public Domain Torrents only tells you how large the file is. So, you might start downloading the movie only to find out that nobody is sharing it, in which case you'll never be able to download it. That's it! Now you can watch the free movie on your computer or convert it to a new video file format and transfer it to your mobile device. Public Domain Torrents is able to release a film when the copyright expires or the original owners don't renew their copyright. However, this doesn't mean that every movie at Public Domain Torrents is automatically legal. We've seen a few slip by that are most definitely not in the public domain, so it's possible that others aren't either. It's up to you to abide by the copyright laws in your country. If you have to, research the film you're interested in before getting it to confirm that it's in fact legal to download. Because these movies are shared via torrents, the quality of each download can be vastly different. We tested a few movies and found their quality to be as decent as a regular DVD movie. Fortunately, because movie downloads are played locally from your computer instead of streamed over the internet, you can get the highest possible quality from the video. This is unlike streaming where the quality can be diminished due to bandwidth issues. However, it should be understood that because most if not all of the selection is older films, and since the quality of older movies is usually lower than modern movies, having full access to the file (versus streaming) still doesn't mean you'll get HD movies. There isn't a Public Domain Torrents app nor is there a mobile-optimized version of the website. 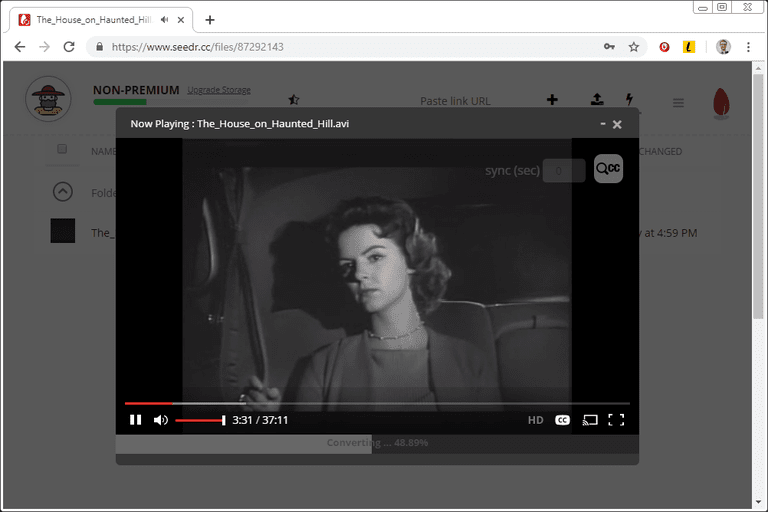 While many movie streaming services provide a mobile app that lets you stream the films anywhere you go, Public Domain Torrents basically ties you down to a computer. You might have luck downloading these torrents from a torrent app on your phone or tablet but it's not as smooth as simply streaming straight from the website. On that note, since these movies are delivered via Adobe Flash, which most mobile devices don't support, a mobile-optimized site wouldn't be much help anyway. Instead of downloading or streaming movies from Public Domain Torrents, you can optionally buy a physical DVD with the movies preloaded on it. This is available for every title. There's also an option to buy every single movie available at Public Domain Torrents on one massive external hard drive. You'll get close to 1,000 movies for several hundred dollars. You can register with Public Domain Torrents so that you can rate movies and leave your own comment. However, even if you don't make a user account, you can still stream and download any and every movie. There's also a forum you can access to chat with other users about movies, which appears to be active at least once a week.